Well, these eyes sure took a lot longer than I expected. It’s a little like what happened with my “little” remodeling job – just change this one little thing, and then you need to change something else, and that means that you have to fiddle with this other thing… Whew! Three hours later, I have a bunny with eyes. Still no paper mache clay on her upper body, but this little girl will get finished soon. Maybe even before I get the saw horses out of my kitchen! Your jewelry is beautiful, Frank. When I talk about adding real pottery clay to the mix (which you really don’t need to do – I just happen to have some on hand so I throw it in) I’m talking about wet low-fire clay. I think any wet clay would have the same effect, since it’s just used to add a little bit of body and smooth out the mix. But if you don’t add it, and are careful to mix the ingredients long enough, the original recipe works great. I loved that video because of the changes to the bunny. You would not just settle which is a good lesson to everyone. Looking forward to your next phase of ballerina bunny. “Soft sculpture bunny dolls with paper mache heads”?? Oh! I can’t wait to see that! I’m still worked up over the soft sculpture greyhound I did last summer that turned into such an epic (for the same fund-raiser you participated in with the greyhound mask of Harry). I’m very interested to see how you integrate the two kinds of materials, soft and hard. It’s always great to see how the artist’s eye needs satisfaction in such an individual way. I thought the bunny looked pretty great, but agree, after the modifications, that you took it in a better direction. Sometimes, it takes a saw and guts. Well, compared to your soft sculpture, I think my bunnies should probably be called “dolls” instead. Did you happen to keep a pattern of your wonderful soft-sculpted greyhound, by the way? The pattern itself would make a nice item for your next fund-raiser. I have a question about the Paper Mache Clay. Firstly, I love using it because it’s easy to manipulate into all sorts of cool things, and the fact that it can be put into the oven to quicken the dry time is awesome too. But, is there any way to stop it from sticking to my hands? I have to keep a bowl of water close by to dip my hands into otherwise the clay sticks to me rather than forming like I want it to. I’ve tried different methods and variations of consistencies with the recipe, maybe you know something I don’t about mixing it that makes it less sticky. Oh yea, I had asked a question before and I was able to get the mask off of the Styrofoam mannequin head with a metal fingernail file and a lot of care and patience. I think it turned out pretty good. For a first time using the clay. Whew! I’m glad it worked. 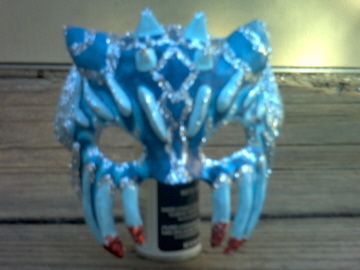 And what a creative mask you made! Very striking! Hi Bobbie. I get a lot of questions about the stickiness, and the only thing I can say is that it has to be sticky, because it needs to stick to the armature. Using cornstarch instead of flour seems to cut the stickiness a little. I think the best way to apply it is with a damp knife instead of your fingers. You get more control that way, and you don’t get the stuff all over yourself. Looking so cute! This is a fun video. Love that you included the alterations you made on this sculpture. Appreciate your inclusion of the saw you used. Much better tool to invest in than the chain saw I was seriously thinking I ought to pick up. Thanks for giving me courage to make mistakes. Love her so far and learned so much from the mistakes. She is a winner in my book. I think she looks beautiful. I can’t wait until you’ve finished her. OH! By the way – she looking cute! Jonni, I love how you show us your struggles as well as the finished products, it makes me feel better that I can’t get things to look like I want them the first time around! You usually make it look so easy that I felt really inept. Now I know it’s not just me! 🙂 Thanks! Jonni, The bunny is looking excellent!!!! I so admire your ingenuity and perseverance with this project. You have such a fun way of teaching….. (Are you an aquarius??) I am learning so much from your videos….thanks again so much!! Hi Kathy. Sagittarius. I’m glad you’re enjoying the videos. 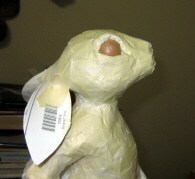 I can’t wait to see your Ballerina Bunny finished. I have never done any Papier mache but am very tempted to try. I think I will use your Paper Clay recipe very soon. I love all your beautiful creations . Wow! One of the neatest things about you is that you are not afraid to say “Oops!” and go backwards to fix. I would have cut you a big break because rabbits don’t have shoulders, and different kinds have different heads, and when you are a rabbit wearing a tutu, I think reality went west anyway………..for anyone who hasn’t seen Jonni’s point of inspiration, here is a website which shows the Degas and clearly illustrates what she’s up against! Thanks for the link, Patch. I like the way they’ve included so many views. And yes, I didn’t really have to go back and change anything, since there’s no possibility of getting it “right” anyway, but changing your mind and making decisions is what it’s all about, right? OMG – too too cute, Did you put her skirt on second to facilitate strength? And will you apply clay to the top side only? A decapitated bunny was getting me very nervous there for a minute!